Black Sequin Sleeve Top is rated 4.5 out of 5 by 15. Sparkle this season in this sequin-sleeve top. The gorgeous sequins to the sleeve are an easy way to tap into the sparkle trend and the slight dipped hem gives you great coverage. 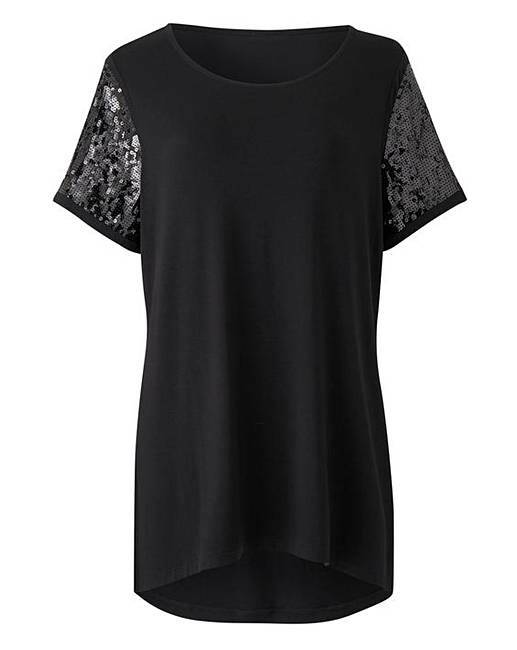 Pair this sparkly number with coated jeans and heels for your next night out or team it with slim-leg trousers and trainers for a chic, casual look. Rated 5 out of 5 by Kay from Excellent Bought this top for a Christmas party. It's a lovely fit and the sleeve details make it . Rated 5 out of 5 by Juju from Sparkly! Lovely top that can be dressed up or down!!! Goes lovely with jeans or trousers. Rated 4 out of 5 by Sandy from Great top I brought this for May Caribbean cruise. Nice for evenings.